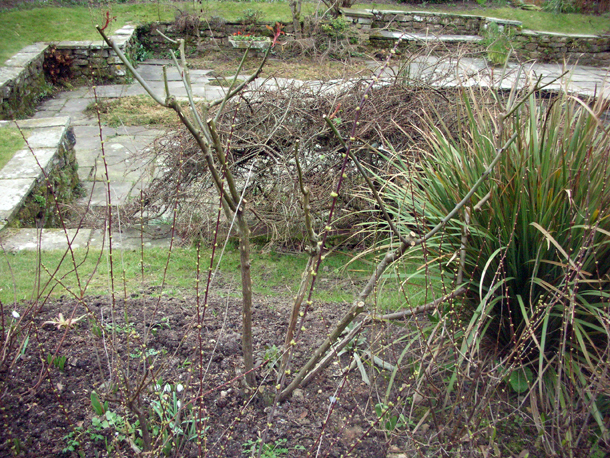 I finished pruning the Rosa Glauca, then moved onto Rosa virginiana, a rose that has nice thin elegant red stems which gives it a nice shape. They are very floriferous so a lot was taken out, but they looked better for it. 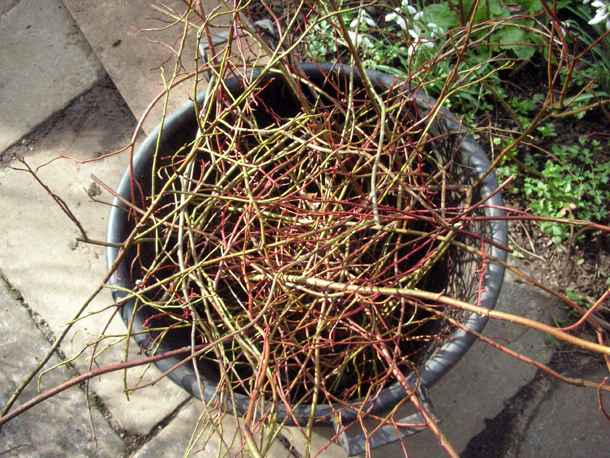 A chance to enhance the red stems as well as helping the plant. There was definitely plenty of flowering stems for the current year. It didn't matter that some of these 'crossed' over because the plant was light & airy enough, especially if it added to aesthetic satisfaction. Rosa virginiana offcuts - the red really stands out but they have olive green stems too. Weather: 8°C. Rainy to begin with, much milder than it has been for a while. The sun finally came out. I was on a pruning mission today. Fergus is properly getting me to prune different plants & namely roses all by myself - to 'read' the plant and prune intuitively to what I think the plant needs. It's a regenerative type of pruning really, which is great because it means not having to fumble around with textbooks trying to remember what the information said, but being able to understand what to do through looking at it. 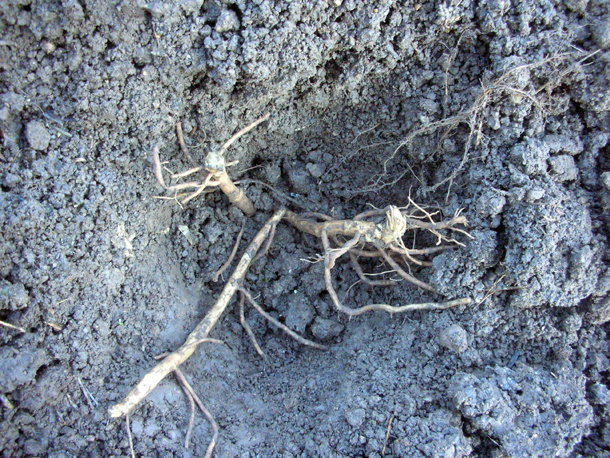 The main aims are to allow maximum sunshine into each stem, for them to be well spaced. Where it has flowered helps give an indication of what year wood flowers come on. 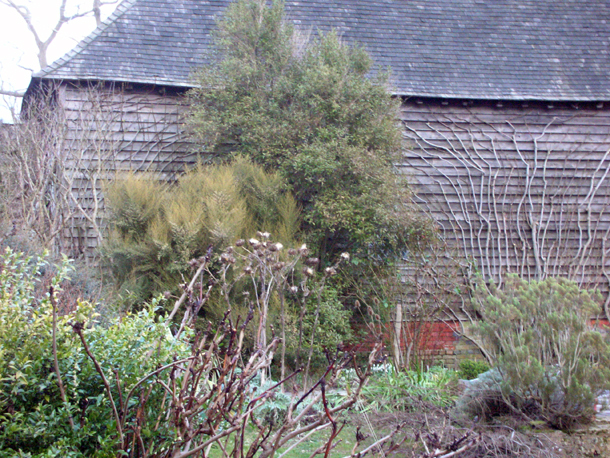 I have been choosing monthly articles/ excerpts for Dixter's website from the archive of Christopher Lloyd's Countrylife transcripts since the 1950s, here are a few interesting things he has to say about pruning - Christopher Lloyd article. Rosa chinensis 'Mutabilis' now known as Rosa × odorata 'Mutabilis' in the Barn Garden. From this one I learnt not to cut middle stems too short even if means cutting off a flowered head to next best flowering stem means doing so, because then they don't risk being crowded out by the others and not being able to grow as well. In this scenario it is best to cut it down to the next best bud. Viburnum compactum opulus, Rosa moyesii (a shrub rose with big red flowers and bulbous hips), Rosa setipoda & Rosa glauca (bluey green leaves & flowers with 5 pink petals), all in the Long Border. 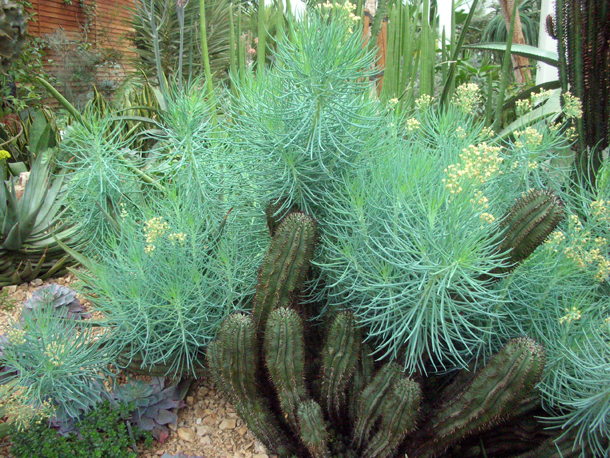 Situated here, the back of these plants can be easily shaded out by the growth at the front. So the best approach was to think about the plant in the shape of a set of steps. Taller at the back and gradually shorter towards the front. Always mindful that everything stays tall enough for the light to hit it. Rosa glauca - the tall thin red branches in the middle nearly camouflaged. Weather: Horrible biting wind again. Moments of sun but not long lasting. Privet at Dixter is grown like no other that I have ever seen. 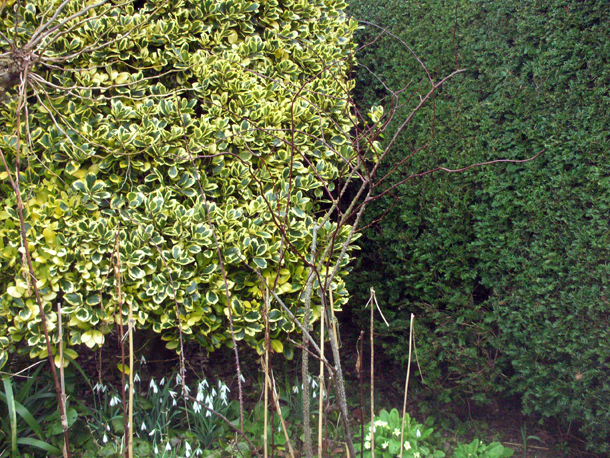 Actually cultivated for its flowers rather than as bog standard hedging plant. They have long elegant flowering stems that stick out like mad hair. These bear panicles of white flowers that weighs the stems down, causing them to arch gracefully. We cut out all the stems that have flowered on old stems. Flowering stems are usually distinguishable because they split into many other offshoot stems, and if lucky confirmed by the telltale dried fruit or flowers. Some of the offshoots may turn into a strong flowering stem. Four or five stems usually come from a 'knuckle'. For this one we naturally thinned it out by taking out all flowered stems to the knuckle, but it is usually best to take out each flowered stem to the next flowering stem if possible to be safe, and then thin it out at the end. It worked out for us in this instance as there was a lot of material and it was hard to reach. Not a rule of thumb, but one might prune two out of five stems per knuckle, but it was better to confirm or do it by eye. For a picture of the Ligustrum in flower follow here. After this, we moved onto some orange blossoms Philadephus including a large one in the Walled Garden next to the privet, and three in the High Garden, one obscured by an Abelia which Fergus thinks is the best one in the garden, one was variegated and one of them was a Philadelphus delavayi 'Calvescens'. These followed similar principles. We didn't try and take out every crossing branch but just to open out the structure more. 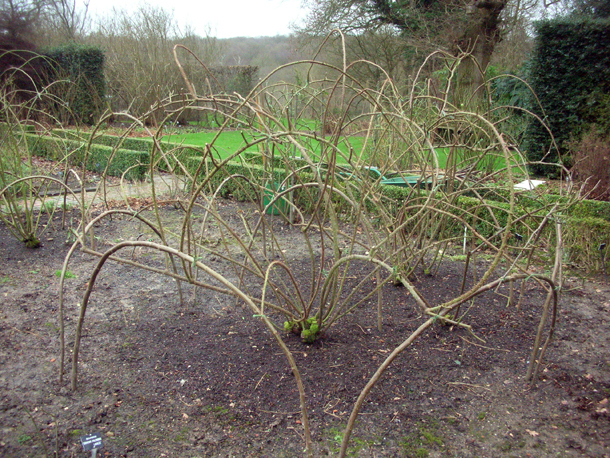 Some were vigorous and had lots of stems, whilst others were quite old and minimal in growth that Fergus had been trying to bring back, so we only gave these a light touch, enough to help regenerate it but not to really manipulate/ shape it. The many bare wavy shaped hydrangeas adds to the layers of textures and colours that are found even at this time of year. The bright pinky red flowers in the middle is the Hellebore 'Anna's Red'. 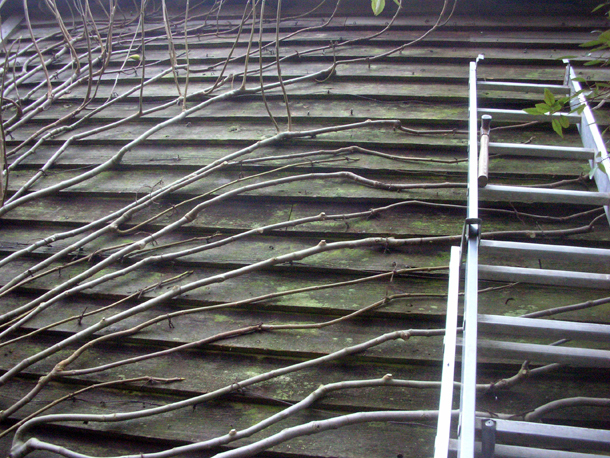 I did more Hydrangea pruning today. I was given Bruce who has come to work in the garden for a month from Kentucky, US to guide and to work together with. This time we tackled cultivars 'Bluebird' & 'Bluewave' in the Blue Garden (hence the name) and each came with their own challenges - some didn't have much flowering stems so we had to strategically decide what we leave. 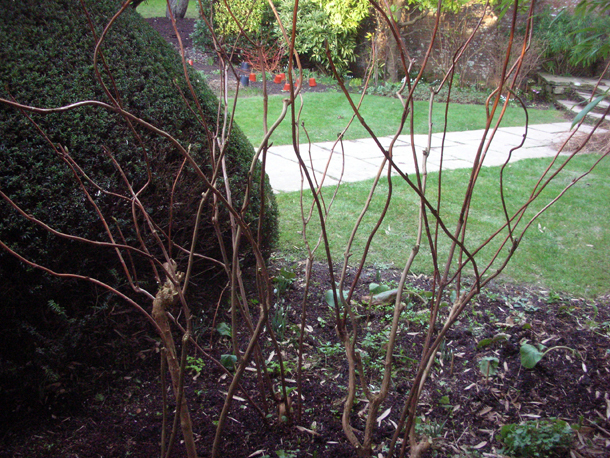 One was intertwined into a Cornus and we had to consider giving space to the stems from the top down. 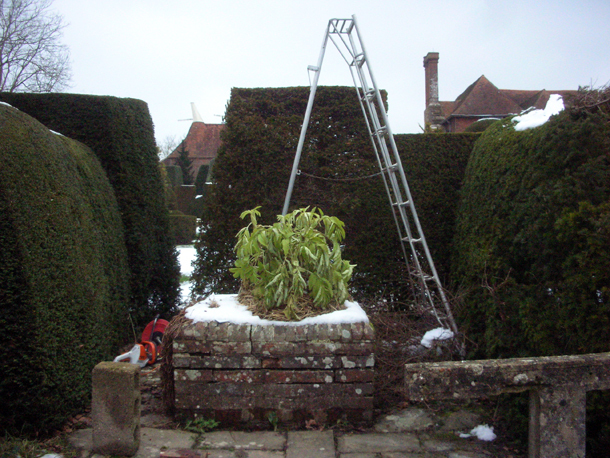 After we moved onto pruning a Ligustrum quihoui in the Walled Garden, this was an interesting challenge. 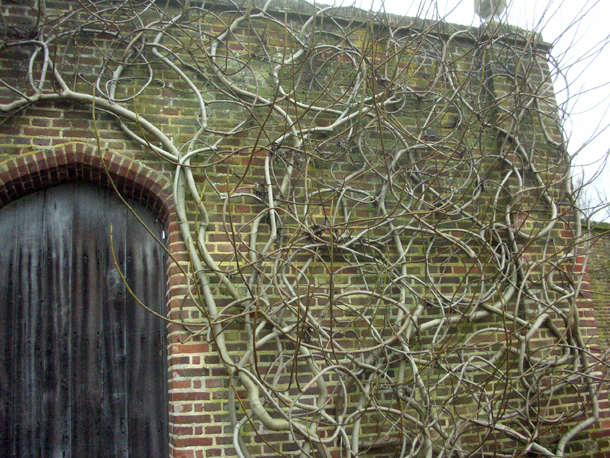 It was tall & dense and had a Clematis montana weaving through as well as being surrounded by fragile Hydrangeas (see future posts for more details on this). Weather: 6°C. Very wet early part of the day, then sun broke out after lunch and the rain held off. We cleared the circular step area today. We cut back all the Erigeron karvinskianus and Asplenium scolopendrium (Hart's Tongue Fern) in the cracks of the drystone wall along the upper moat & circular steps, making sure that we didn't touch any of the aubretias as they hate being cut. Then we trimmed the edges of the meadow creeping into the narrow border along the moat, took out the dead leaves of Iris foetidissima & dug out any creeping thistles (Cirsium arvense). 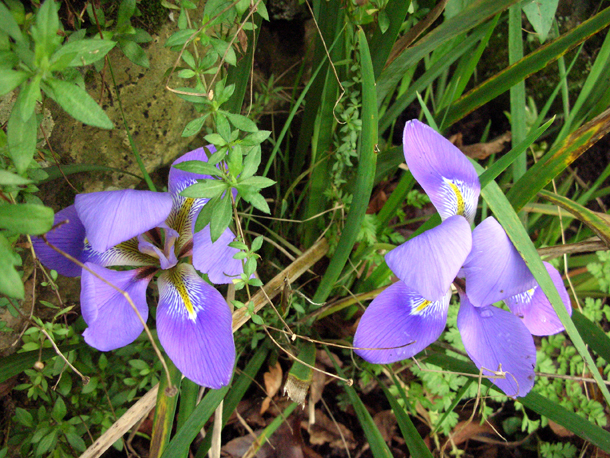 Iris unguicularis can also be found near the steps and the moat at this time of year. Their flowers come up sporadically so as strategically not to all get killed off if there is a frost. When bent down really low, one can intake their sweet gentle scent. Weather: 9 - 10°C. Rainy & windy at first then sunny. 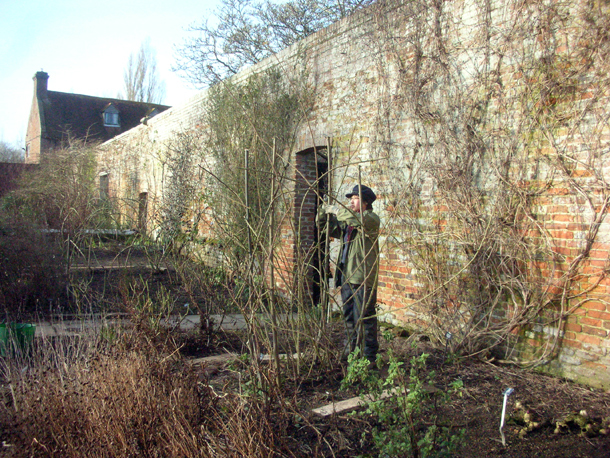 Today we had a go at pruning the upright trained roses at Sissinghurst. 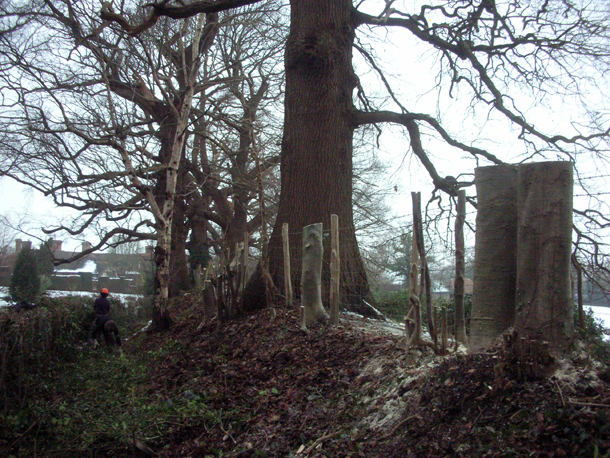 This time we used chestnut coppice as four upright posts, forming a long thin box sort of area. 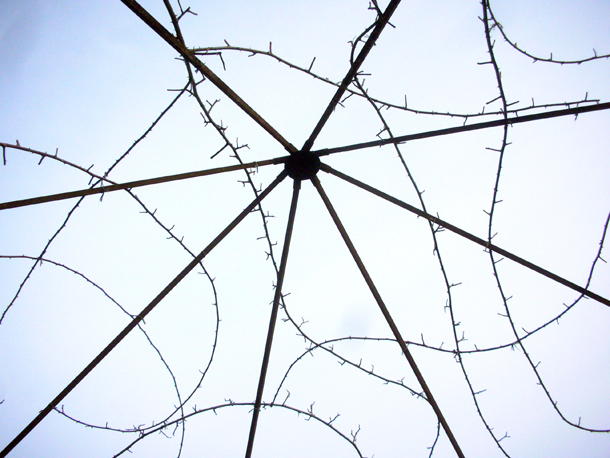 I was advised by Jo to think of it as dealing with four walls. Again last years training and framework was dismantled and fresh wood was used. The rose we dealt with was called Rosa 'William Lobb' which has long stems densely spiked. It is an old rambling kind of rose and has double petals. The sprawling mass of arches that we pruned the day before was a Rosa 'Ulrich Brunner Fils' which is a hybrid perpetual which despite its name is a rose that often only really blooms once, but was bred so that there might be a chance they would repeat flower. Hybrid teas superseded these. Again we 'snibbled' any dead or unwanted overly short stems. We had to wrap the stems around the 'four walls' as well spaced as possible, adopting a loose criss-cross type of pattern, guided a little by where the stems wanted to bend. 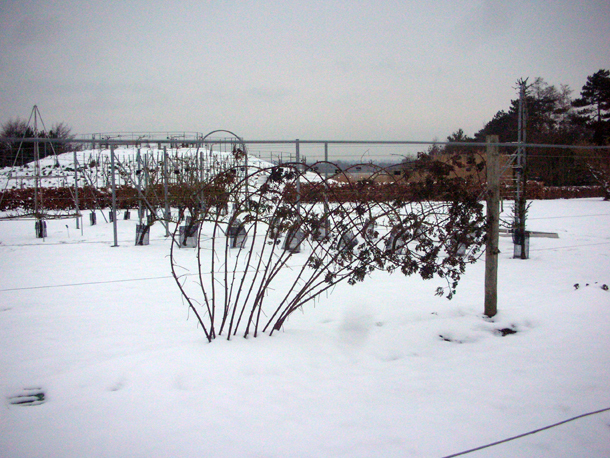 They had to be exposed outside of the poles as much as possible, as once it grows it will be thick with foliage and there will not be much light inside. There was one essential rule - you do not bend the rose stem lower than where it was growing, or that stem will die. This was the same for the sprawling mass of roses earlier. One got rid of any excess or overly awkward stems as we went along, again trying to judge ahead as we did it - what was good to keep, what we wanted to the overall framework to look like, good spacing and the best advantage for the plant in this situation. Weather: Cold, sunny & dry in the morning. Then moody and windy later on. 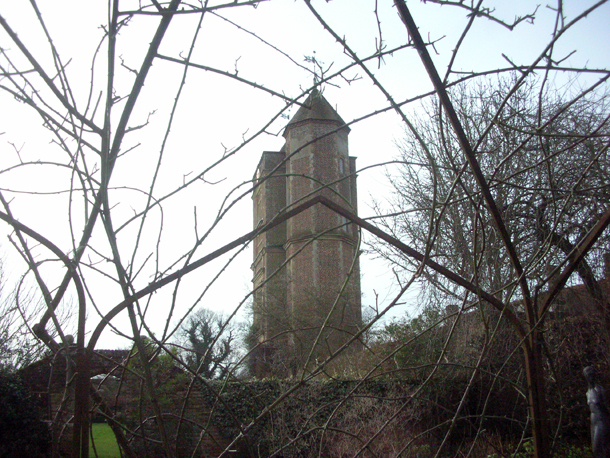 I have heard much about it, but this was my first time to Sissinghurst, the ex-garden of Vita Sackville-West - poet and garden writer. The place had a magical air about it especially in the glimpse of a rare early morning sun. It oozed its own character, maybe from its history and the way it has been used. 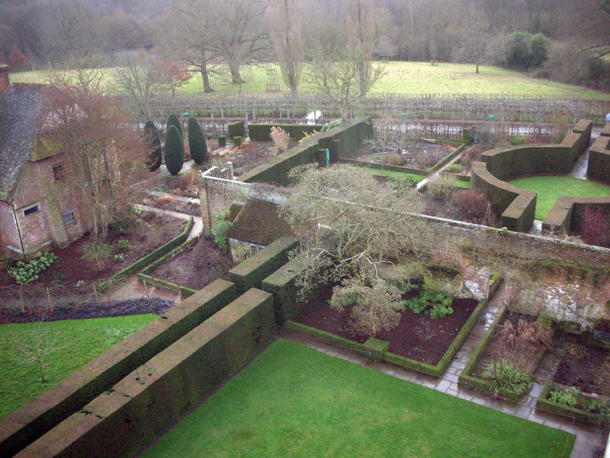 One of the things that we did was view the garden from the tower, which also housed Vita's writing room. It made me feel that everyone should have their own tower so that they can always have an aerial perspective of things. The hedges were a very different affair here. Tall and incredibly straight I was told that a spirit level was used to get them so linear, and that newcomers had a practice bush first and had to prove their capability before they were and allowed to be unleashed on these. You can appreciate just how sharp the edges and smooth the surfaces are when you particularly view them from above. One of the amazing sprawling mass of roses, the type that we worked on. I have never seen roses trained in this way before and what better time to see it then the heart of winter when everything is pared back to its bare bones. I worked with Jo who showed me the ropes of how it was all done. 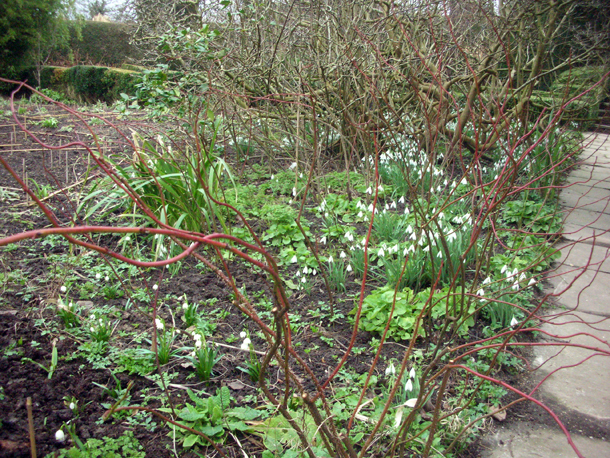 Several clumps of roses are tied and trained to hazel benders coppiced from their own nuttery. First we undid all the ties. 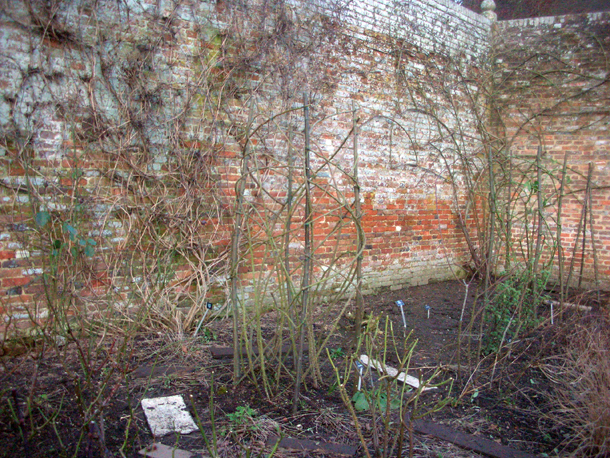 Then 'snibbled' away all the dead & weedy bits and lengths of roses that were not very long or so good for training down to two or three buds. 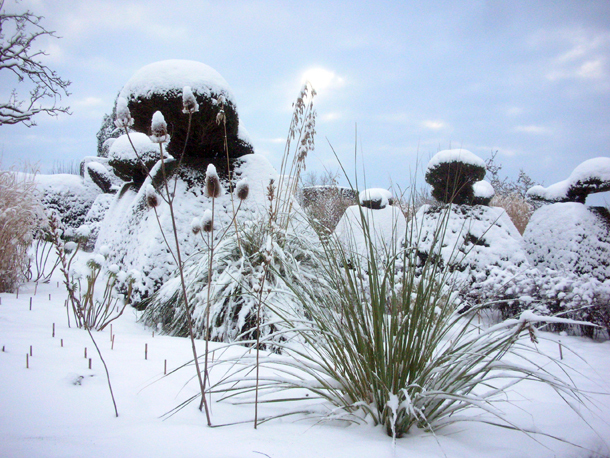 'Snibbling' is a special Sissinghurst term coined by the well known head gardeners Pam and Sybille who looked after the garden during Vita's time and after. When we had untied and snibbled all the lengths of roses, we made fresh benders by shaping them into stakes at one end with a billhook. 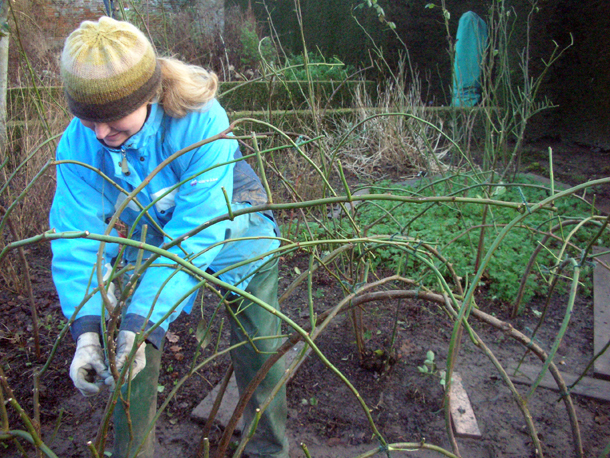 Then we pre-bent the hazel so that it would be flexibly ready when we stuck them in the ground. The whole process is less rigorous than one might expect and is more like sculpting as you go along. But it is one where experience helps develop the eye and intuition to see good shapes and ways of tying it together. Essentially, we strategically placed the benders where it would allow the the roses to be trained as a guiding structure at its best shape, and set about tying each long stem to the bender or to itself or another rose, whichever was most appropriate. It was like placing arches after arches on top of each other. Height was important, but shapes need to somehow look quite 'natural' and not too awkward. And you had to think ahead all the time, how would one stem affect another, and leaving long ones at the end, so that you had these to play with to help fill any gapingly obvious gaps. The stems themselves helped inform how they should be best bent and placed where, although there were always the odd ones that you had to manipulate a bit more to fit them in better. You can also start see how the stems can start supporting each other, so that it holds itself together and the likely chance of it springing out is almost nil. String is an easy commodity to use too wastefully in an exercise like this. So its always good to be thoughtful about how much one is cutting for its purpose. The knot we used was like a figure of eight one to prevent rubbing, if the stems were to be tied to the bender then we would attach it on with one that was similar to a cloves hitch. 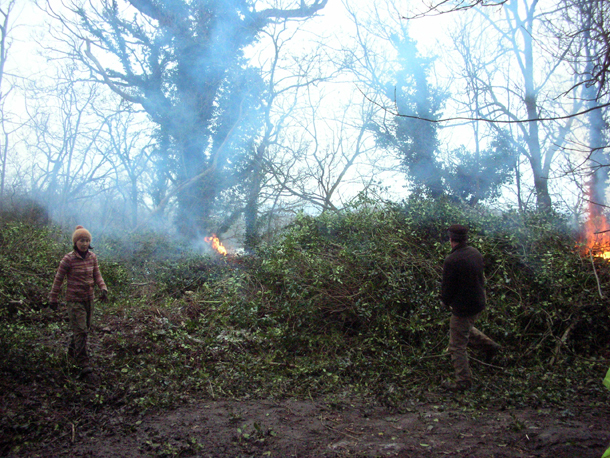 We carried on with clearing the holly hedge and oak area along the driveway. 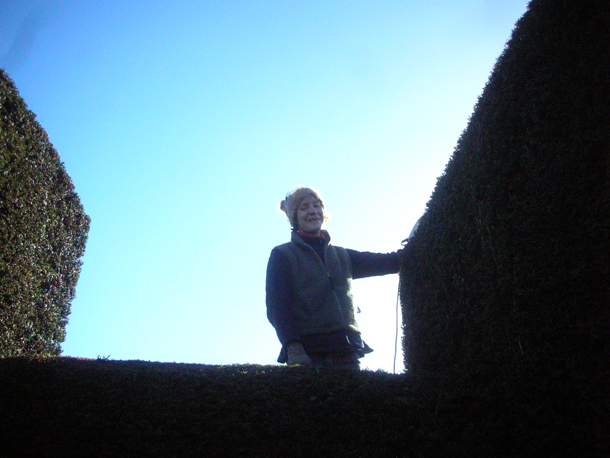 Then me and my colleague Rachael resumed with hedge-cutting. This time we worked on the boundary line, the longest hedge adjacent to the Long Border and where the meadow is opposite this. Already we are working against the clock as shoots have started to come up through the grass, and we had to tread precariously. Anytime there was a crunch or a squishing underfoot there was a sickening feeling that it might be some new growth. Weather: 11 °C, windy and light drizzle most of the day. Weather: Around 10, sunny, still windy but less so. 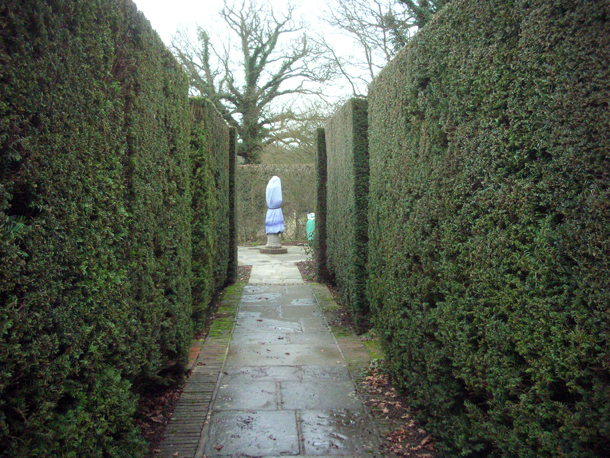 As it was drier it made it easier as the yew off-cuts were sticking less to the hedge and on us. And I didn't have to wipe my glasses like a window-wiper every few moments. 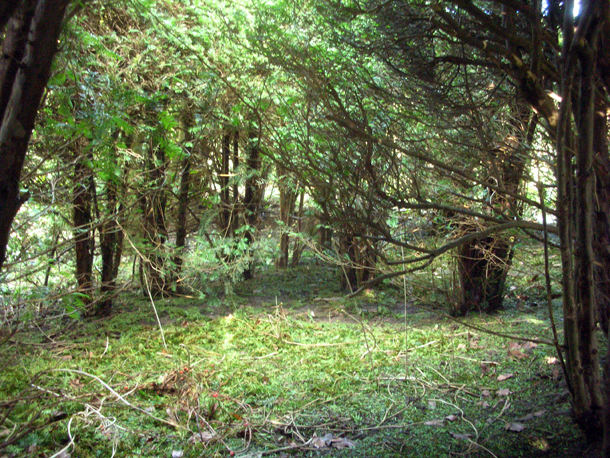 We had to crawl under the hedge to get to one side of the boundary and to a secret space. It opened out as if to a chamber underneath. 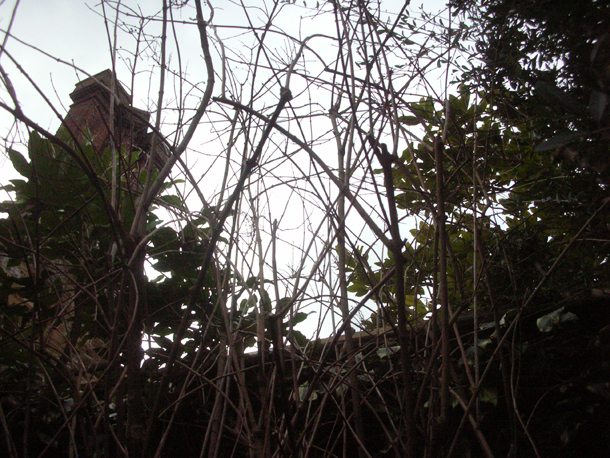 For details of how we approached the hedge-cutting click here and here. Weather: Snow has started to melt and go slushy. Around - 1 to 1°C. Slight drizzle in the afternoon and more snow that didn't settle. Carried on cutting down the Ilex in the driveway. 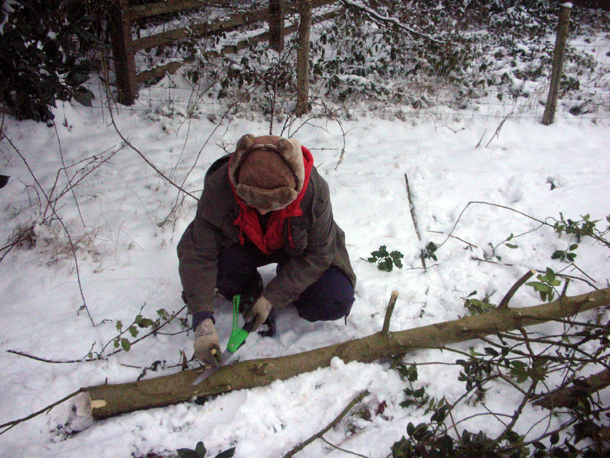 I was tidying up the stumps and stray bits of holly still around with loppers. There were three bonfires being lit to deal with the excess of material coming out. 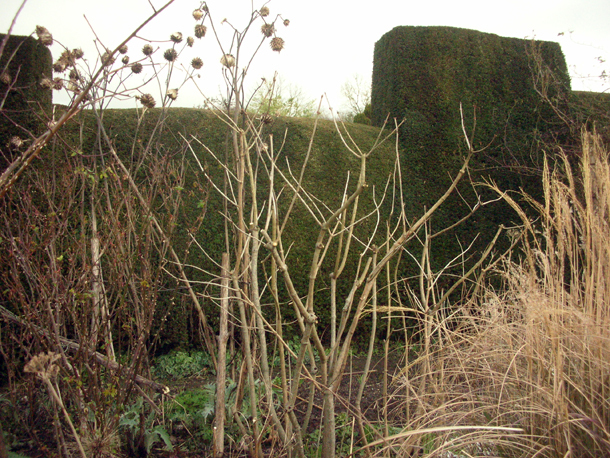 Then we continued with hedgecutting, I finished trimming around the edges of the nursery. 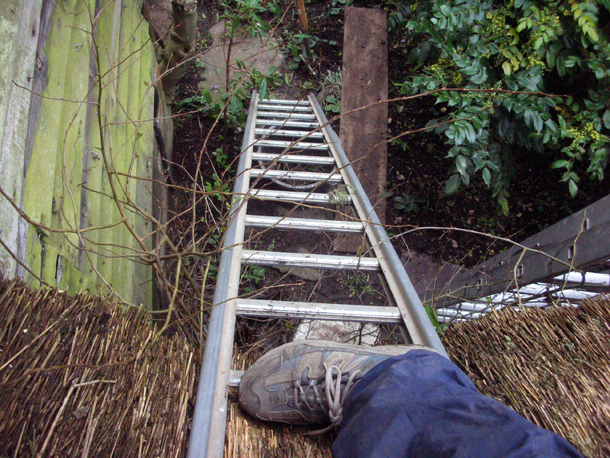 I have been feeling a bit shaky going quite high up but I think I have finally combatted my fear of this. I realised that half of it is finding the right ladder and good ladder using practice helps a lot. 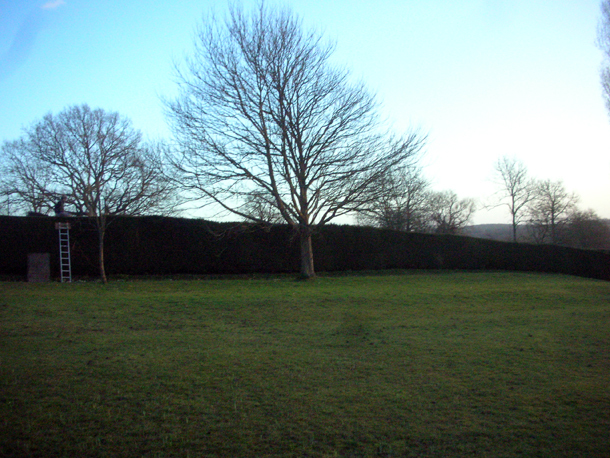 In another part of the garden, the huge Quercus ilex hedges were being cut. The clippings have been kept aside to be picked up by London Zoo, as apparently the Holm Oak is a favourite of giraffes. 1. Cornus alternifolia argentea - can have bright red stems when young - aka The Wedding Tiered tree. An unusual large shrub that is like its common name has abundant tiers of white flowers. 2. Eating pear Pyrus communis 'Doyenne du comice'. The clue could be the pointy alternate brown buds that it has. 3. (Top) Hydrangea macrophylla 'Ayesha'. Macrophylla are the mophead types, 'Ayesha' is distinguishable to other hydrangeas of this species is that its petals turn in. 4. Alder glutinosa aka Common Alder - the deciduous tree native to Britain. It can grow up to 35m and is a good strong wood that can be used underwater, so prefers a wet habitat and has been used in boat building, piers etc. It has had interesting folklore surrounding it and has been associated with the devil because the wood is red when you cut it. The catkins on this particular one is purple. I have seen them with bright pink ones also. 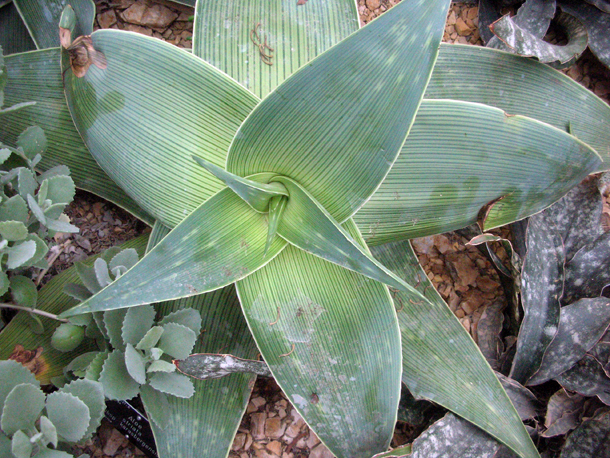 Their leaves are ovalish shape with a distinctive indentation at the top. 5. The seedhead of a Peonia delavayi - the tree peony that has maroon flowers and yellow stamens. It can grow quite widely and up to 2m tall. 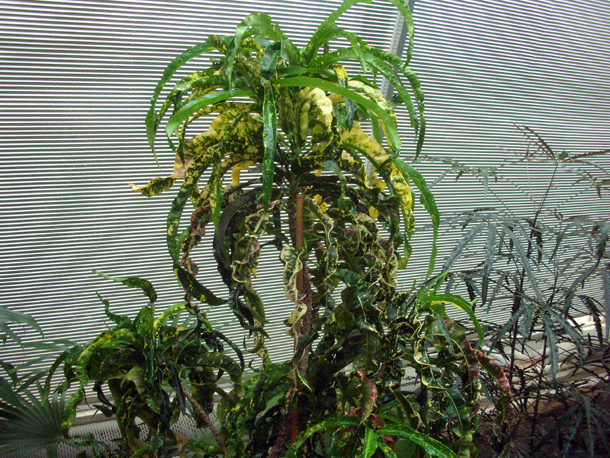 It has large deep divided leaves. 7. (The stubby one with the hoof like black buds) Fraxinus excelsior - the common ash troubled by the fungal disease Chalara fraxinea at the moment. Another tree native to Europe is also good for timber and burns well even when green. It is tough but springy so good for handles like axes. Can reach up to 43m. It has a big bushy habit and often a long bole (main trunk) and an airy crown. They have 'keys' as seeds. Leaves are compound (made up of lance-shaped leaflets), about 30cm long and unique in that there are no native other tree with leaves like it. 8. 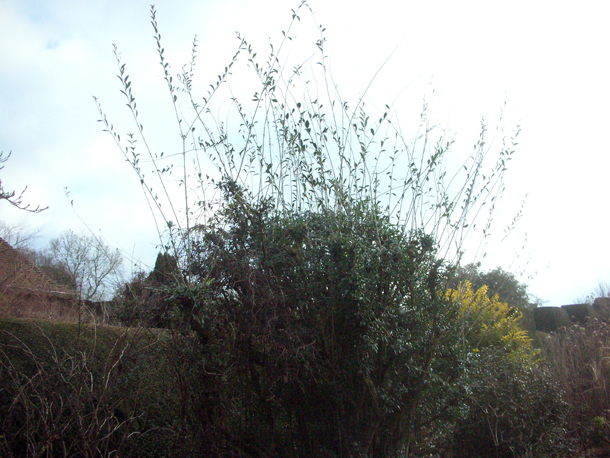 (Top thin multi-stemmed one) Salix sp. - shiny twig, possibly a coral bark one (if so then it will have bright orange twigs as a whole) - another one of those trees that can have colourful stems like Cornus. 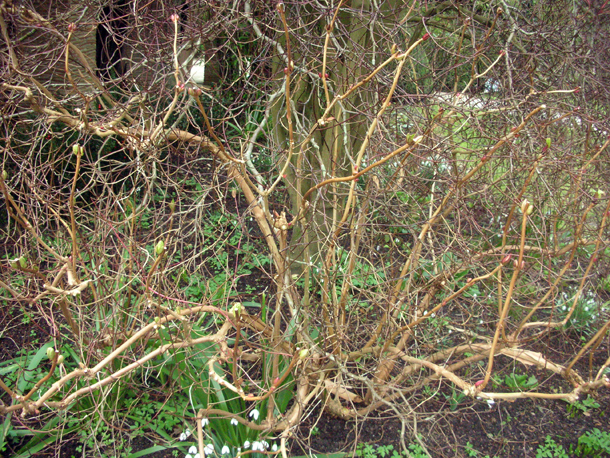 A good way of distinguishing it from a Cornus is that it has alternate buds instead of opposite ones that rotate. 9. Ficus 'Brunswick' not so clear in the photo but this fruiting tree is distinguishable by the green tip buds at the end of the stem. This tree can be found on the wall in front of the terrace of the house. 10. Quercus robur seeing this I realised I had never looked at an English Oak properly. It has clusters of buds at the end of twigs. 11. And we meet again - Clerodendron bungei, I've had it in leaf form and in flower form, now the twig. 12. Cornus sanguinea 'Midwinter Fire', when confronted with a plant grown for its colourful stems I always wonder how best to maintain and prune it so that you get the best display out of the plants as much as possible. 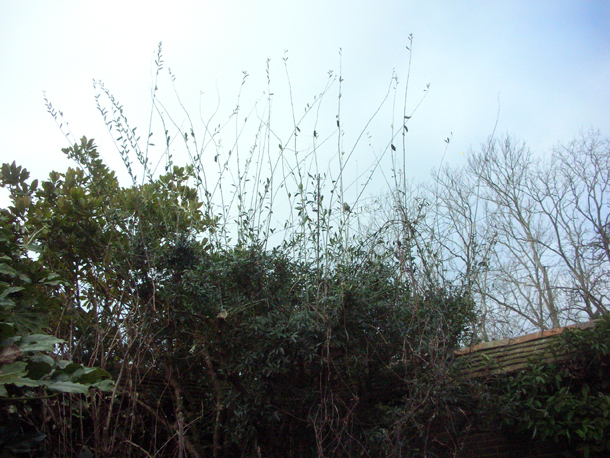 According to the RHS this particular cornus can just be pruned every two years in late winter or early spring, and then you would cut it 60 - 90cm above the ground and thin out side shoots to encourage more branching. It is probably good to feed it every year especially after pruning, and water it well in dry summers. There was also Rosa virginiana - a rose that has thorny red stems which I have taken cuttings of before which give lovely autumn colour. Weather: Still snowy and cold. Again -1 to 2°C. Our Head Gardener Fergus is part of the RHS plant trials committee and he had a meeting at Wisley, so we went along with him to visit the garden. Being in an outdoor garden all the time one forgets how this time of year greenhouses can still remain so lush & vibrant, and how great it is to be transported for a moment. Camellias looked great indoors, Bananas stood tall and fruiting, their cactii & succulents were actually flowering away. Their Senecio petasites were towering and filled with big panicles of yellow flowers, unlike ours that are in the hothouse but that is used in a way to store plants instead of to display them. So they don't quite look the same at the moment. Different kinds of Justicia featured with colourful and jazzy flowers. Plants are so diverse in colours and textures that I feel any textile that has ever been made is just a replica of what already exists within the plant world. There was a butterfly exhibition and this was held in the hot and steamy section of the glasshouse. There was a display case that had live pupae in different stages. 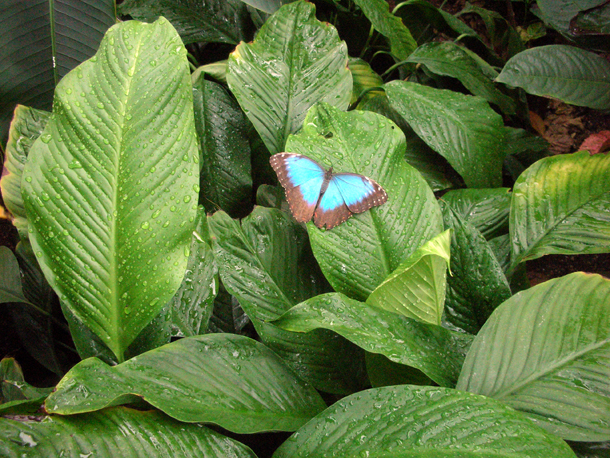 And it was interesting to overhear that some butterflies will only lay its eggs on certain kind of plants. 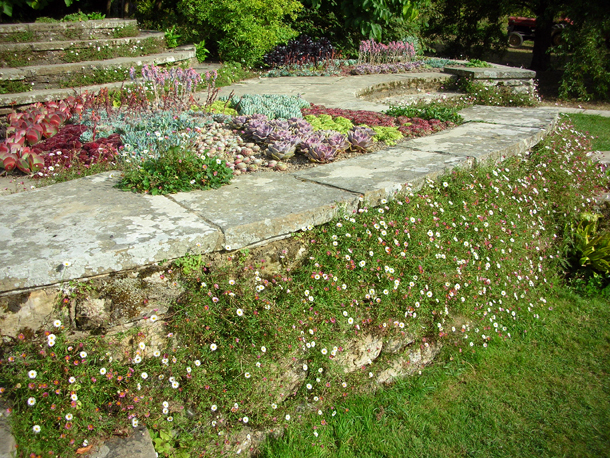 My favourite thing always at Wisley is the rock garden and alpine houses. The alpine house without fail was exemplary as always. It smelt of spring and so fresh as soon as you entered. 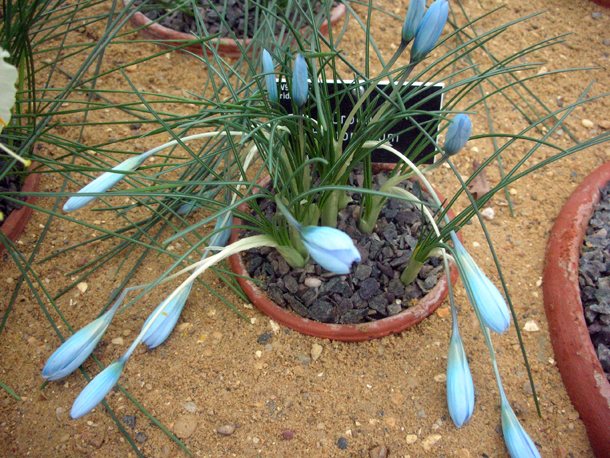 Petite forms of Narcissus in pots, everything so precise and delicate. 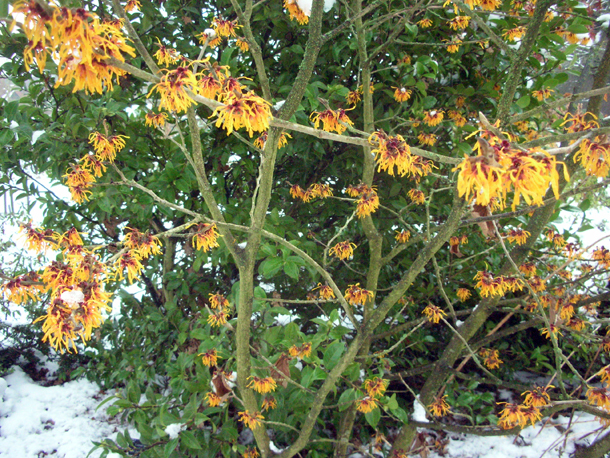 One of the highlights were Hamamelis in flower on Battleston Hill. We sampled the delights of these by sight and by smell. We judged that the best smelling one was a yellow one called Hamamelis x intermedia 'Gimbourne's Perfume'. The fruit tree training displays were impressive and what better time to see these then now, when the bare bones of the structure is revealed. Weather: Everywhere was covered in snow, the world was transformed. The air was still and it didn't feel that cold - probably around 1 or 2°C. The light of the sky was extraordinary, almost surreal. It reminded me of a Japanese film that I saw where the sceneries were heightened backdrops of colour and light. We started the ambitious task today of cutting back all the Ilex along the main driveway where one is only suppose to come into an avenue of oak trees, but over the years Ilex had self sowed and had turned into a dense thicket in between the trees. Doing this has changed that area quite dramatically and now you can start seeing the beautiful view of the rolling fields and woods beyond. It has opened it up and is letting in more light too. We kept back long lengths of holly of substantial width, as it has a really close grain, it's a strong wood and is potentially good for something (rumour has it that it is great for whittling into a spoon). 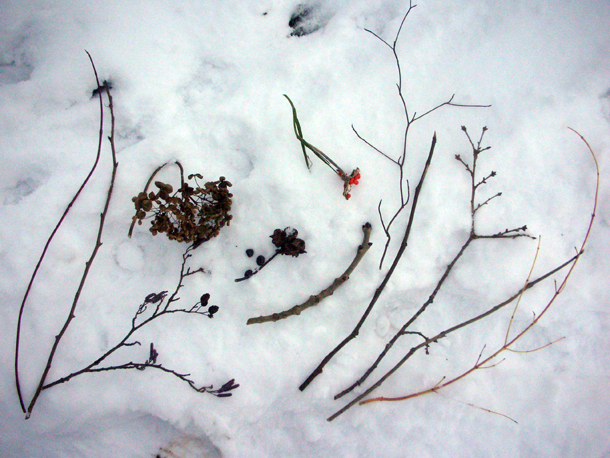 We took off all the side branches and took these and all the brashy bits to Pen Stump to burn in a bonfire. Weather: Cold! -2°C. The sky was dark and there was this strange quiet in the air like the calm before the storm. In the afternoon the tension broke and the snow began to fall. 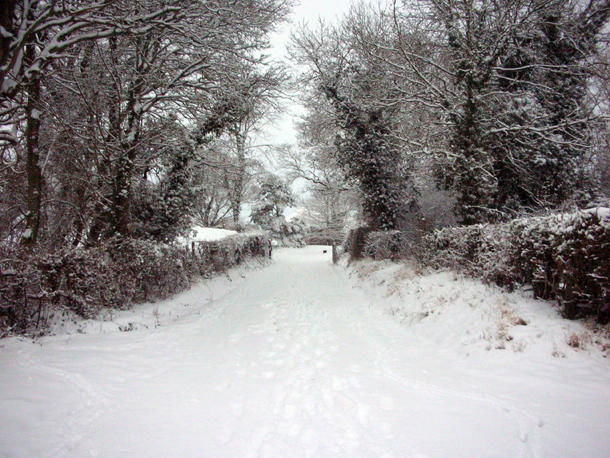 A wonderful muffling & silence descends upon the earth when it snows. We continued doing some more planting in the in between spaces of the High Garden stock bed, giving it the finishing touches. We scattered Allium - 'Purple Sensation', Angelica and Lychnis coronaria around. It is an artful way of incorporating plants for reserves, sometimes we have to balance needing to use plants up because of the lack of space and making room for other things, as well as it serving as a stock bed for the nursery and to still give a pleasurable display. 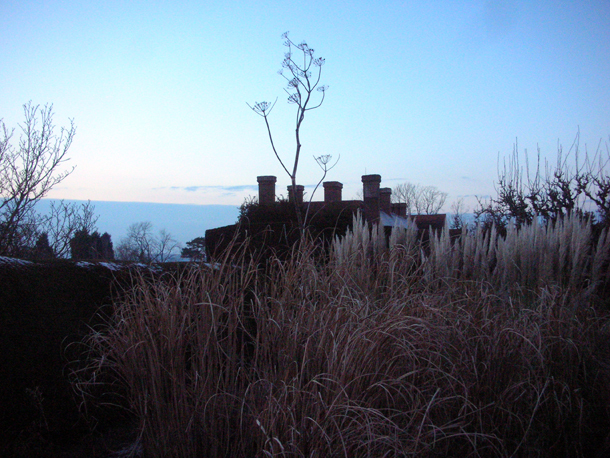 We heeled some Miscanthus sinensis 'Gracillimus' that had been dug out of the bed into a smaller screened one near by. Then we went indoors to pot up clumps of Allium bulbs that were unused, and geraniums with 4-5 growing points to a small square pot that we call Black Jim. Weather: Deep frost again, which makes it even colder when the frost from the day before has not thawed yet. In the air it is threatening to snow. We worked on the stock beds in the High Garden today, dug up big clumps of Helianthus angustifolia that has not been moved for about three years and has stretched its roots out a bit too keenly. These we sorted through and took out the ones with the best growing points and replanted them three at a time. 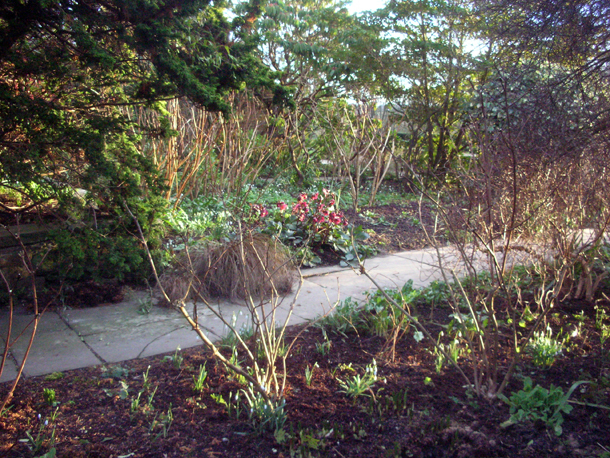 Any bulbs that can came out - alliums, crocosmia etc we sorted and re-distributed them throughout the beds. We carved big sections and shapes out of this large space. It is amazing how graphic this process is and even to the lesser trained eye, you can envision how it will work and what it will look like. My colleague Rachael pointed out that garden was akin to cooking, you understand the ingredients and then you're able to start putting it together and sensualise everything as a whole with all its different layers. Cooking is second nature to me, so this gives me hope that I will be able to attain the same fluidity with gardening, as I remember a time when cooking was first learnt. Many little things come together as a whole. 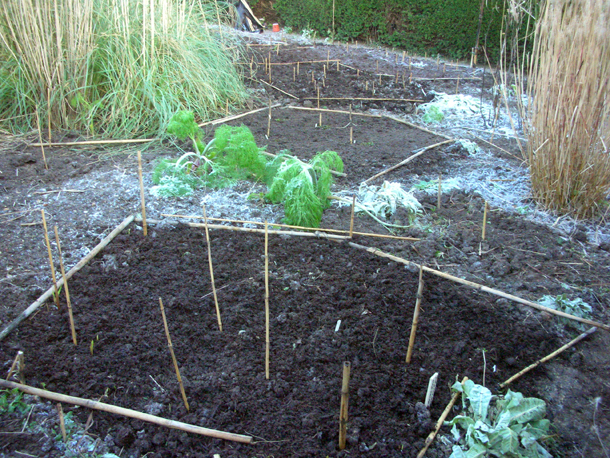 Louise and Fergus went round planting Parsnips (Pastinaca sativa) in all the between spaces. We were like a network of busy bees and then at the end of the day we worked the traces of us out of there bit by bit.